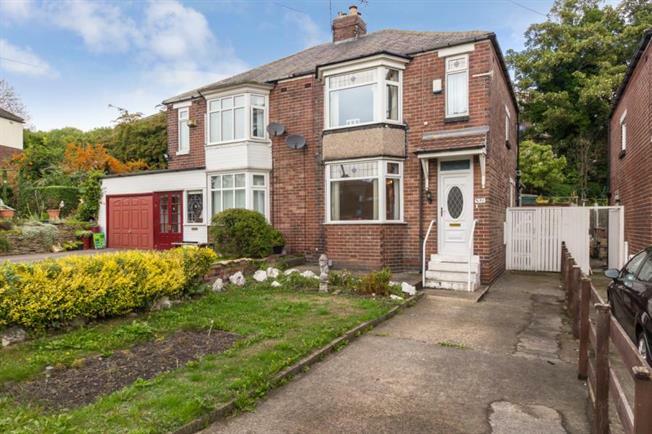 3 Bedroom Semi Detached House For Sale in Sheffield for £100,000. An attractive three bedroom semi standing well back from the road and whilst requiring some upgrading offering excellent potential. The accommodation incorporates on the ground floor an Entrance Hall, Bay Windowed Lounge, Bay Windowed Dining Kitchen with units ,hob and oven and a pantry, Utility Porch with W.C.off. On the first floor is a landing,3 Bedrooms and a Bathroom/W.C. with shower over the bath. Outside is a pleasant front garden with car pull in and to the rear generous garden with shed. The house has background heating and double glazing. The property is conveniently located with easy access to the City Centre and has good local amenities.